Plants densely tufted, mat-forming by means of rooting culm tips. Culms 1.5-3 times as wide as thick, 20-100 cm × 0.35-2 mm, firm to hard, wiry, with to 8 subacute ribs, rarely nearly smooth; some culms arching or decumbent and rooting at tips. Leaves: distal leaf sheaths not splitting abaxially, proximally dark red to brown, apex usually reddish. Spikelets ovoid, 5-17 × 2.5-5 mm, apex acute; spikelets on stolons rudimentary, non-flowering, proliferous when rooting; proximal scale empty, amplexicaulous, ovate, 2-4 mm; subproximal scale with flower; floral scales 20-40, 2-3 per mm of rachilla, stramineous to medium brown, midrib region paler, ovate, 3.5-6 × 2-3 mm, membranous to cartilaginous, apex entire, rounded to subacute. Flowers: perianth bristles brown, equaling achene or tubercle, densely spinulose; anthers brown, 2-2.4 mm. Achenes often very variable within one plant, ovoid to obovoid or obpyriform, 1.5-2.5 × 1-1.2 mm, beak to 1 × 0.6 mm. Tubercles when present pale to dark brown, pyramidal, to 0.5 × 0.3 mm. Fruiting late spring in south, summer-fall in north. 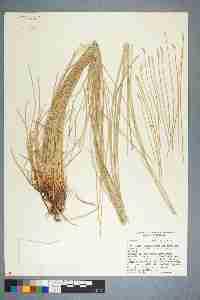 Very wet calcareous or brackish fens, springs, shores; 50-2400 m; B.C., N.S., Ont. ; Ariz., Calif., Conn., Del., Fla., Idaho, Ill., Ind., Kans., La., Maine, Md., Mass., Mich., Minn., Mont., Nebr., Nev., N.J., N.Mex., N.Y., N.C., Ohio, Okla., Pa., R.I., S.C., S.Dak., Tex., Utah, Va., Wash., Wis., Wyo. ; Mexico; West Indies (Cuba, Haiti, Puerto Rico). 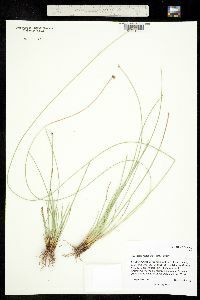 Eleocharis rostellata is highly competitive, often forming large monospecific colonies. The South American E. platypus C. B. Clarke is often treated as a synonym of E. rostellata. 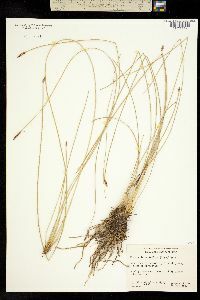 Eleocharis rostellata superfically closely resembles E. suksdorfiana in its culms, spikelets, and achenes, but differs in the absence of creeping rhizomes, presence of stoloniferous culms, absence of a flower in the proximal scale, and achene surface details. The collection of E. rostellata I have seen from Miami-Dade County, Florida, is from 1877. I have not seen vouchers for Archuleta County, Colorado, by H. D. Harrington (1954), or for the localities in Montana and South Carolina, which are based on the map in H. K. Svenson (1934). Perennial herb, densely tufted, forming mats by way of rooting culm ends 20 cm - 1 m tall Leaves: reduced to bladeless sheaths, basal, two per culm, margins fused and enclosing culm, not splitting, dark reddish to brown basally, with a reddish rounded apex. Flowers: minute, spirally arranged on the axis of the spikelet, lacking sepals and petals, with bristles, subtended by a scale. Bristles brown, equal to the achene. Stamens exserted. Anthers brown, to almost 2.5 mm long. Pistil one. Style three-cleft. Fruit: a one-seeded achene, variable, light green to brown, 1.5 - 2.5 mm long, about 1 mm wide, egg-shaped to reverse egg-shaped or reverse pear-shaped, rounded three-angled to plano-convex (one side flat, the other convex). Tubercle (when present) light to dark brown, tiny, pyramidal. Seed with a thin, non-adherent wall. Culm: unbranched, 20 cm - 1 m long, 1 - 2 mm wide, wiry, more or less compressed, to eight-ribbed, enclosed basally by two fused sheaths. Some culms elongated, recurved, and rooting at the ends. 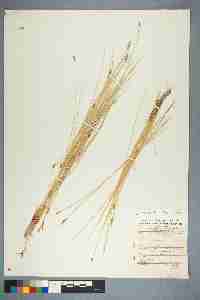 Spikelets: solitary, 0.5 - 1.5 cm long, 2.5 - 5 mm wide, egg-shaped with a pointed apex, with 20 to 40 floral scales. Scales spirally arranged and overlapping, straw-colored to brown with a paler midrib, 3.5 - 6 mm long (bottom scale 2 - 4 mm long), 2 - 3 mm wide, egg-shaped with a rounded or nearly pointed apex, membranous to cartilage-like. Habitat and ecology: Rare in the Chicago Region, but characteristic of marl flats, marly seeps, and tufa flats. Etymology: Eleocharis comes from the Greek words heleios, meaning "dwelling in a marsh," and charis, meaning grace. Rostellata means "with a small beak." Springy marshes and wet, marl borders of lakes. 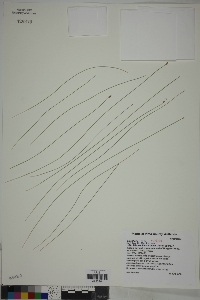 Cespitose perennial; stems (2-)4-10+ dm, ±flattened at least distally and 1-2 mm wide, generally some much elongate, recurved to the ground, and rooting; spikelet fusiform, (5-)8-13 mm, with (5-)10-20(-25) fls; scales equaling or surpassing the achene, firm, ovate, obtuse or the upper acute, scarious-margined, the lowest one empty; bristles ca equal to achene, retrorse- serrate; style trifid; achene light greenish to brown, rounded-trigonous to planoconvex, smooth or slightly cellular-roughened, 1.9-2.8 mm including the prominent, pale tubercle, this up to 0.75 mm and confluent with the body. Saline or calcareous swamps and marshes along the coast from N.S. to Fla. and locally inland to Ill., Mich., Wis., and Minn.; widespread in w. U.S. and trop. Amer.